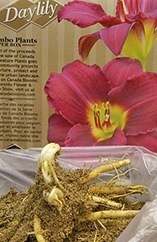 If perennials come shipped as bare-root plants without soil or a pot – don’t panic. Plants without soil is doing to keep shipping costs down. As long as the roots were packed in damp newspaper, peat or wood shavings, and you unpack the plants as soon as you get them, this shouldn’t hurt them. Generally such plants come with a bit of peat moss around roots, which are wrapped in plastic or foil to keep them moist. Even if your mail order plants look dead, stay calm. Most plants are shipped while dormant – the state of limbo when growth shuts down for winter – but their roots are alive and ready to grow. To reassure yourself, look for generous and healthy roots. A good root system has a lot of growing energy stored up and most plants recover from shipping quite quickly and begin to grow as soon as they get the chance. Your package should come with detailed planting instructions. With just shipped plants, it helps to soak the roots in a bucket of water for an hour or so and then get them into a pot or the soil as soon as possible. A new plant may take some time to leaf out and settle into its new home, so be patient. Don’t write it off after a few days — give it a couple of weeks. If you feel your mail order plant is too small or delicate for the garden, or if it is still too cold and too early for planting outside, transplant it into a pot with potting soil. Make sure the pot fits the size of the roots; don’t use a pot that is too big. Water and fertilize, and grow it on under lights indoors or in a sheltered spot outdoors for a few weeks. The plants generally double in size in no time at all. If you have kept the plant indoors, be sure to harden it off properly before planting it out into the garden.